Jean has recently been doing a bit of teaching on the road, but travel time doesn't keep her from being productive! She made this sweet little pincushion on an airplane trip last week. The project uses very few materials and is extremely portable! Use Fabric Basting Glue by Sewline (shown above) to tack down wool pieces until the stitching is complete...no pins required! Barbara Shapel visiting next week! Barbara Shapel, from Washougal, WA , will be in our classroom next week teaching two very fun workshops! Barabara is an award winning quilter, who is best known for her "thread-painted' quilts and machine quilting. She enjoys the challenge of integrating the quilting line and making it an important part of the overall design of a piece. Another challenge that Barbara sets for herself is creating two-sided quilts, where the back of the quilt is a reflection of the quilt front and offers the viewer a different perspective of the same piece. click here for workshop details and registration! 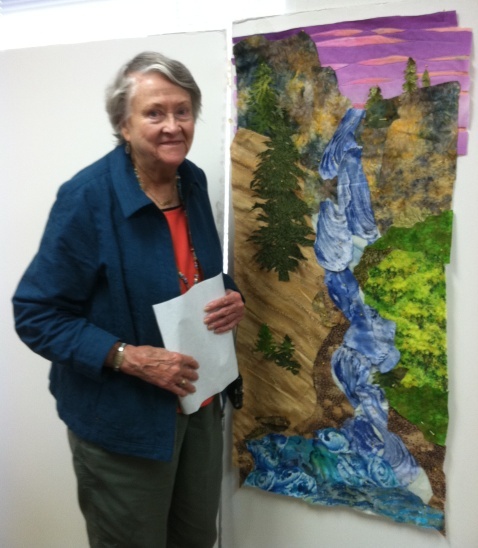 "The Art of Machine Quilting"
Last fall, Terri attended Jean's "Intuitive Color and Design 2" workshop. Today, she sent in a photo of her completed project which she refers to as her "Greece project." She said that other than the color, it is completely different than what she had started in class. I think it is just beautiful and very calming to look at. Great job Terri! Jean is currently in a transition phase with her workshops. 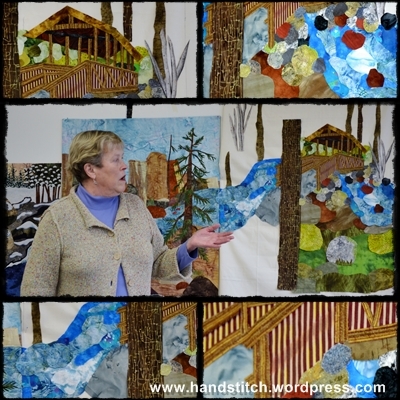 Her new book "Journey to Inspired Art Quilting" will be out this summer. She is, of course, designing a new series of workshops based on the new book. The first workshop (at the Stitchin' Post) will be November 16, 17 & 18, 2012. Reserve your space today! 2012 "Small Wonders" quilts are arriving! The "Small Wonders" Challenge Quilts are starting to arrive...and they are wonderful! This is the second year for the Small Wonders Challenge. 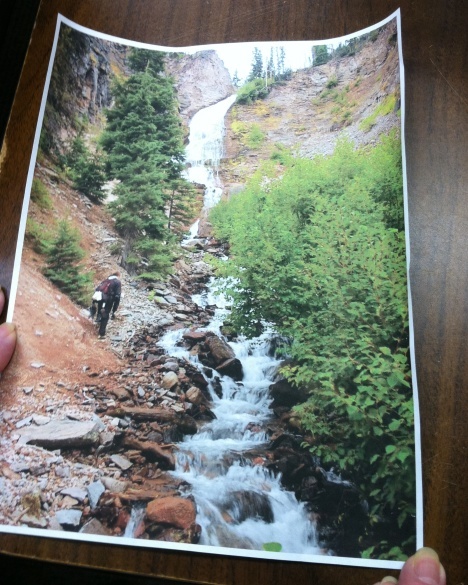 The project is a fundraiser for Sisters Outdoor Quilt Show (SOQS) and Sisters Parks & Recreation District (SPRD). SPRD provides much needed art, athletics and other activities for the youth of Sisters. Sisters Outdoor Quilt Show is thrilled to be able to help support SPRD! There is also a contest aspect to the challenge, where participants have a chance to win one of six $100 prizes. Thank you Michael Miller Fabrics for sponsoring the Small Wonders Challenge! Click here for details about contest entry and prize categories. Keep an eye on SOQS Facebook page~ photos will be posted as entries arrive and you can follow along. In June, e-voting will be available for the Viewer's Choice Award and our friends from out of the area get a chance to participate, too! Don't forget, to join us at the Stitchin' Post May 31st (5-7 pm) for a reception. All Small Wonders quilts will be on display at the Stitchin' Post throughout the month of June. When the invitation to join with a group of quilters to do this quilt came to me, I was eager to join in the project. I’ve followed the Whychus Creek restoration project in the news, and I would love to see fish swimming through Sisters! Since moving here seven years ago, I’ve liked the pedestrian bridge over Whychus as it flows through Creekside Park. It is a landmark of Sisters. I always know I’m home when I drive past the bridge. It was a slow start for my quilt. I took many pictures in all weather, trying to get a view of the bridge that pleased and inspired me. I walked the park, sometimes shivering in the cold, studying the area around the bridge, its construction, and the way the water flows. I tried to get to know the bridge and the creek in a deeper way. One day was rock study day and I was amazed to see for the first time that some of the rocks in and around the creek are a rusty red. Finally I decided upon a view of the bridge and finished the basic design. Throughout the project I had help, suggestions and gifts of fabric from friends that encouraged me and made the design better. I’ve used Susan Carlson’s collage technique to construct the quilt. This method is truly “construction,” an apt term for building a bridge! The picture portrays my quilt panel with about 75% finished. The Metolius River flows its sparkly way through an enchanting winter landscape. Bare branches represent winter willows. I wanted to suggest movement of water and the mystery of the forest--I always feel quiet magic there. I used fabric I dyed or painted along with commercially printed goods. The colors are somewhat brighter than wintry, but I felt the life beneath the winter cold and tried to express that. It's a privilege and honor to be part of this worthwhile project, especially since it is for such a great cause! And it has been fun. We are all excited to see the completed project hung as one exhibit. When I accepted the challenge to do the headwaters of Whychus Creek, I rationally knew this was the source or the place where the water of a stream originates. I have in the past made several realistic or representational quilts. But I at first did not have a vision of the headwaters, because I had not been there to see the source. Neither could I find pictures. I talked with several people and it became clear that my quilt had to include the Three Sisters Mountains, with snow and rocks for the water to flow from beneath the rocks. The creek also needed to be large enough to meet at the right side where the next quilt #2 meets my quilt. 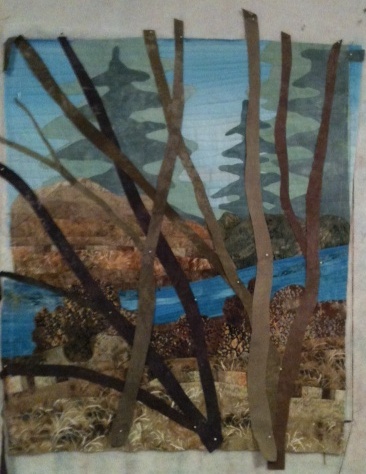 My quilt, “Headwaters of Whychus Creek,” is a product of my imagination that hopefully fulfills the above challenges. 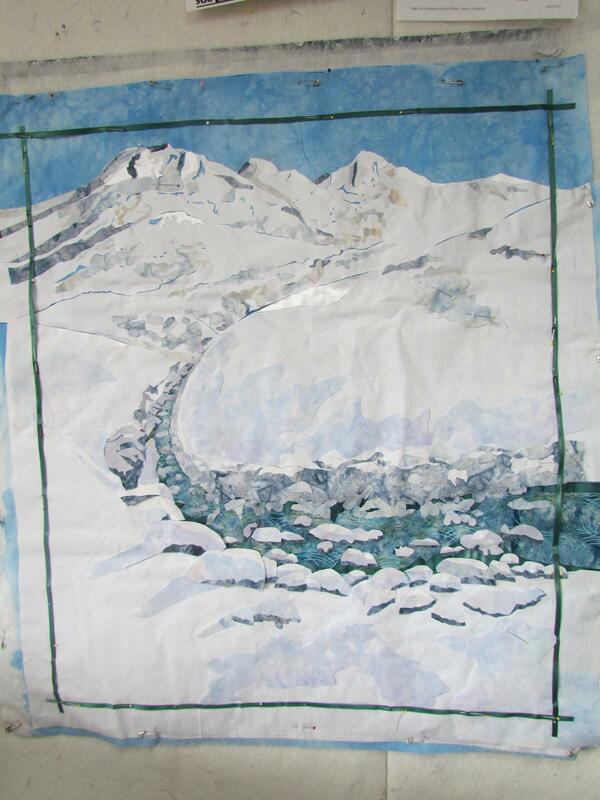 Another challenge I had was working predominantly in white since this is a snow scene. My pieces normally show my love of color. As a native Central Oregonian, I have seen many changes in this area both positive and negative. This project is very important to me, to be able to help even in this very small amount to contribute to the restoration of the beauty of Central Oregon’s Whychus Creek for future generations. I currently reside in Terrebonne, have sewn my whole life and wear my newest title “Grammy” as a badge of honor.